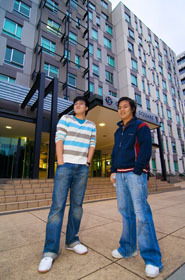 For many of the international student residents of College Square student apartments in Melbourne’s Swanston Street, high speed internet access is a part of life back at home and meeting their high expectations has in the past proved a challenge. These spacious self-contained apartments are ideally located within walking distance of internationally renowned tertiary institutions including the University of Melbourne and RMIT and were hardwired with Gigabit Ethernet to every room during construction. However the installation of structured cabling in an apartment building is only the first step in the development of an efficient and profitable residential broadband solution that meet the expectations of both users and building managers alike, and providing a return-on-investment to the telecommunications provider requires utilisation of advanced systems and software. With the pressure on to radically overhaul the internet service being offered to College Square residents, whose arrival for the 2011 academic year was imminent, the YMCA reached out to telecommunications specialist Spirit Telecom. With a looming deadline and limited experience in residential broadband the search was on for a bullet-proof application that was able to seamlessly manage registration, authentication, billing and payment. A referral to communications solutions provider DuxTel proved fortuitous. During their evaluation of the DuxCommander management software it soon became “pretty obvious that it was the way to go” says Spirit Telecom Managing Director Geoff Neate. In the previous years, the annual influx of new residents had faced long queues at reception to fill in hardcopy forms and have identification photocopied by non-technical staff who then grappled with technical support issues. “They couldn’t satisfy the students and they were losing money” says Geoff. For the first time, new College Square residents simply connected to the in-room jack and were directed to a signup portal, managed via the DuxTel Commander Solution, that allowed them to immediately buy access with a credit card. Geoff adds that “They don’t need to call us or contact YMCA, the process is much more efficient for everyone and has eliminated the language barrier”. Uptake of the Spirit Telecoms service has grown rapidly in a few months to over 70 percent of residents who rate the new service highly on ease of use, level of control over their access plan and performance over the previous year. “We’ve moved YMCA from a reception level to a residential level of provisioning that occurs within the accommodation itself under a model we call ‘plug, pay and play’. YMCA management are much happier and it has eliminated a lot of grief”. “The ease of implementation and support from Duxtel has been impressive” says Spirt General Manager Joe Tigel. “Extra development has been done promptly and we appreciate the management interface to the DuxCommander that maintains the user experience of the web. Even though there was significant time pressure it was a very smooth deployment”. Plans are already underway for even tighter integration between the DuxTel Commander and Spirit’s internal billing systems as well as provision of wireless access in every room to support the myriad devices such as tablets, smartphones and gaming consoles that are a feature of modern student life. “We now have much greater control of the market at the retail level and can cross-promote mobile bundles or offer a month of free access to increase uptake and help bring about a return-on-investment in a more reasonable timeline” says Geoff. “Until we discovered Duxtel we didn’t realise it could be that easy. The College Square project has opened our eyes to a massive new market opportunity in residential broadband that if we execute correctly will significantly change the company”. A rapidly growing mid-tier telecommunications provider, Spirit Telecom has ranked in BRW magazines Fast 100 in 2009, 2010 and 2011 and specialises in premium business broadband, hosting and fixed and mobile telephony.